Web forms and surveys are awesome, or at least they can be. You see, modern inbound marketing and product development are based on one thing: asking questions. Web forms let you collect specific data and contact information from your prospects, leads and customers in a really smart way. We have already talked about how to enhance lead engagement with Wufoo forms by creating a Personalized Video for every lead, but today I want to let you know about a web form service with a clear focus on the user experience and how to create personalized videos using that service. The way you present and design your web forms and surveys is as important as the questions by themselves. Typeform is a service that helps you create beautiful online forms and surveys. As they say, “is built for versatility. Create anything from a simple contact form to a complex IQ test or even an online checkout.” And it’s true. Here you can also find lead generation oriented web forms by Typeform. One of my favorite things about Typeform is that the web forms and surveys service is integrated with Zapier. When creating an inbound marketing strategy, embracing marketing automation platforms is a must. Zapier makes this really easy by helping you connect more than 500 business apps in minutes, no integration required. Use this link to test it now :-). It’s a 30 secs. survey. Then check your email. Every time a new prospect, lead or user has completed a survey or any other type of form, a personalized video will be automatically created. This automatic creation of video speeds up effective marketing strategies and helps you save time and resources, since everything happens in real-time on the cloud. Zapier will link Typeform and Sezion so you don’t need to worry about any kind of integration and it literally takes up to 10 minutes to have everything in place. Onces Sezion has created the personalized video, the new video link can instantly be added to your email marketing messages. This can also be done through Zapier, which connects Sezion to services like Active Campaign, Salesforce, and Infusion Soft, among others. It’s not magic. It’s about facts. Personalized videos can help you increase lead engagement by 54%. Personalization is the norm when it comes to effective marketing strategies and video plays an important role. Harris Interactive concluded that 80% of people who shop online will have a positive response to a company’s marketing messages if it has been personalized. This is why modern marketers have a clear emphasis on using personalization to increase their level of engagement. 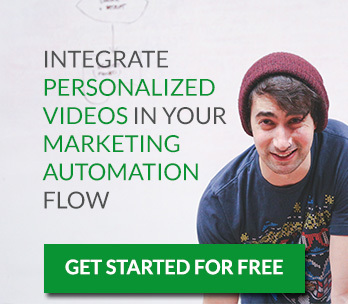 Personalized Videos, Video Marketing, Web video, Zapier. permalink. Interesting strategy. I didn’t know personalized video could be automated. Also, thanks for mentioning ActiveCampaign! Thanks Brian! We are big fans of ActiveCampaign! We should probably write about it and record a how-to video too. That would be awesome, Josías. Let me know when it is done and I’ll make sure it gets shared. Hey, thanks! I really appreciate it! This is pretty cool strategy. I see text being automated, I’m wondering where it’s going to next — can parts of an audio be automated as well? Like a thank you video.. so the person says, “Thank you .. insert name..” type of thing. Thanks Jeremy! Audio can also be personalized, but right now using a third-party solution (TTS) integrated with Sezion. TTS is coming to Sezion… We’ll keep you posted.